Our company was established in Biella in 1947, just after the Second World War, by Ramella Pietro. We started our activity repairing and modifying textile machinery. In 1954 we produced our first carding set and after this first success we created a project department to develop new machines. In 1963, after a good experience in the textile field, our Company moved into a bigger workshop and the following year we doubled this building to increase the carding machines production. In these years we enlarged our production range constructing wadding cards and garnetts. 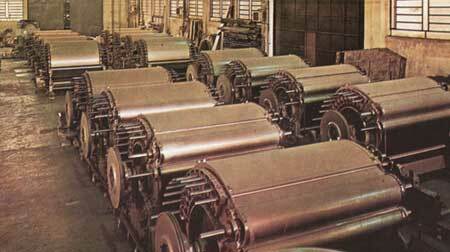 In 1971 we built another workshop with a structural works department for the rollers production and the heat-treatment. In 1980, following the market needs, we introduced new tool machines and we built a new workshop for the CNC production and the machinery assembling. Actually our factory consists of 3 industrial buildings covering a surface of 8000 sq.meters. In more than 60 years of activity we acquired a great experience in the carding machines construction due to the cooperation with important Italian and foreign textile managers. Our machines are delivered to many countries where they enjoy excellent reputation as to quality, high productivity and economy. Our carding sets can manufacture first class fibres that meet highest quality standards on the world textile market. Ramella textile machines also excel for technological progress, our last example is the realization of a complete textile line for mini-mills and laboratories.